Hey guys! So we've finally come to the end of February which can only mean one thing. 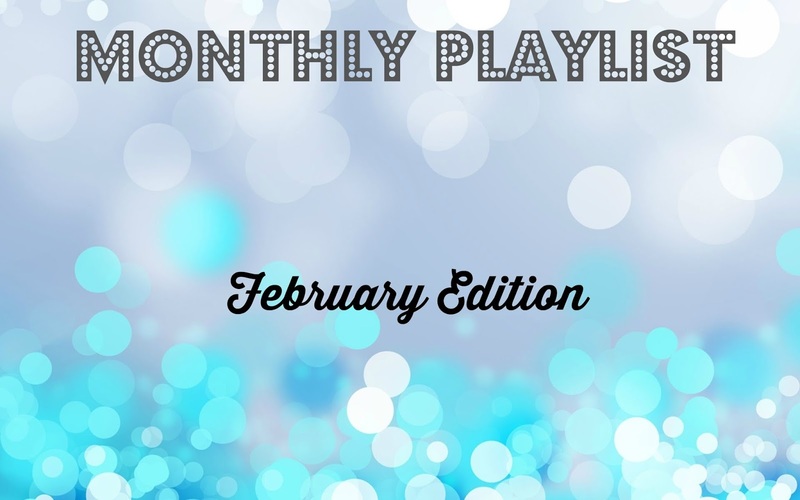 It's monthly favorites time! I can't believe how fast this year is going! I have had a pretty hectic month and if I'm totally honest it hasn't been the happiest of months either. If you have read my previous posts then you may know I've been a bit down in the dumps lately. I wasn't going to share why on here but I think I may need to as I need advice and I think letting it all out where hopefully some of you can offer me advice would be good. I just don't want to come across as attention seeking. Oh the dilemma! But anyway, let me get back to what this post was meant to be about in the first place. As usual there are a few old favorites here that you would have probably seen many a time before but I have included a few new favorites here as well which I think will be of interest to all of you beauty lovers out there. 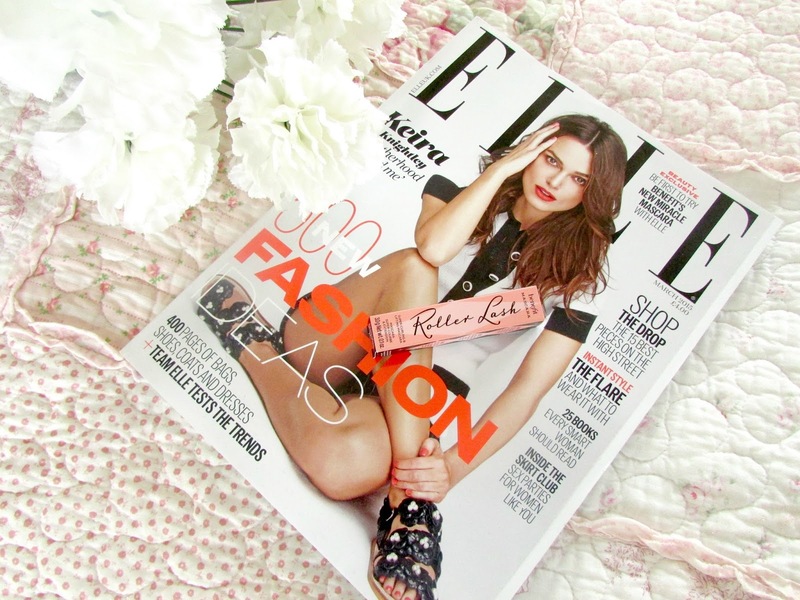 I love reading favorites posts as I think they are a great way to discover new products. So here are all the products that I have been loving throughout February. ENJOY! This bottle of goodness has been reviewed on my blog and has been mentioned in so many other previous monthly favorites too. However, I may have neglected it slightly in the last couple of months. I picked it back up towards the end of January and I'm just absolutely loving it again. 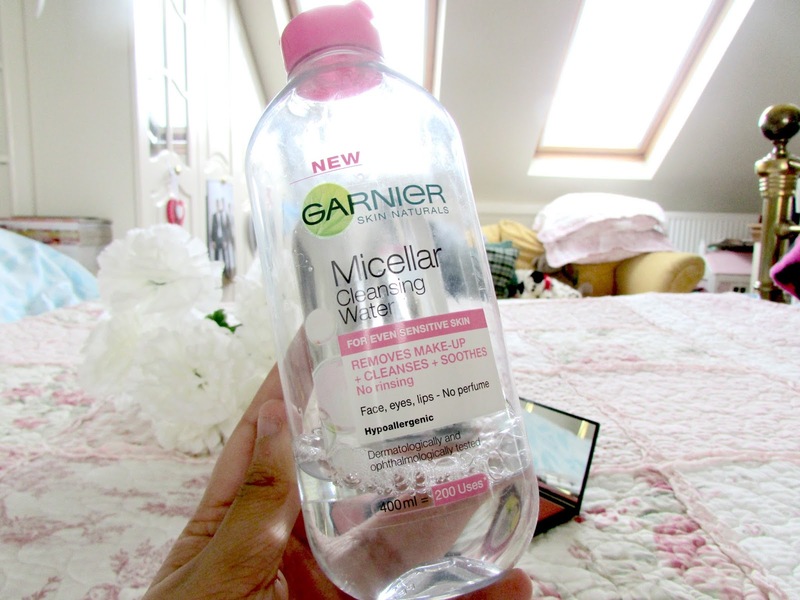 It removes all traces of make up super quickly, even the toughest of eye make up can be removed with this and just feels so super refreshing on the skin. If you've tried Bioderma but may be on the look out for a cheaper drugstore alternative then I would highly recommend this one from Garnier. 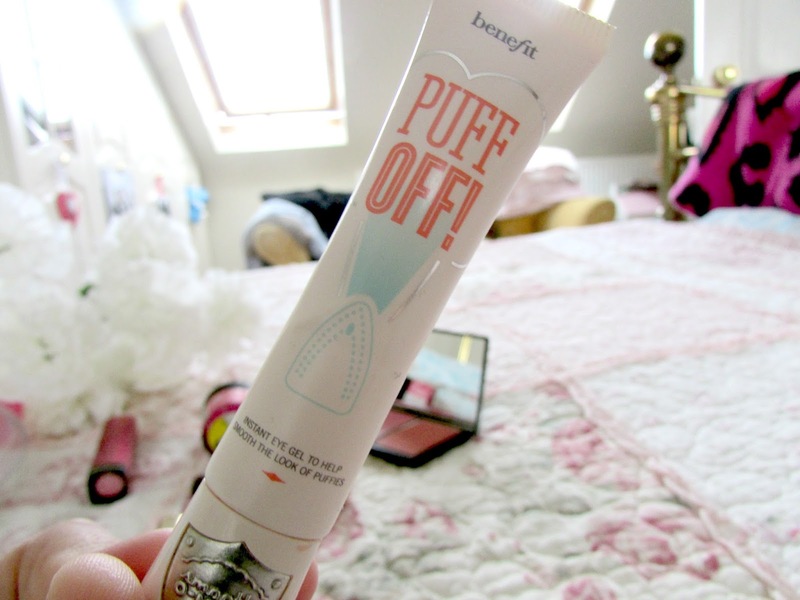 A new release this month was Benefit's Puff Off. I am always on the look out for decent eye creams and I still haven't found one where I'm like 'Wow, this is a staple' but this one definitely comes close. I absolutely love everything about this product from the gorgeous packaging to the amazing tip shaped like an iron. The iron tip is designed to cool the eye area which it definitely does. It's super refreshing to use in the mornings and I find the cream to be extremely hydrating. I use it every morning and I absolutely love it! I have a full review coming up on my blog in a couple of days so be sure to stay tuned for that. Can you tell I've been loving Benefit this month? 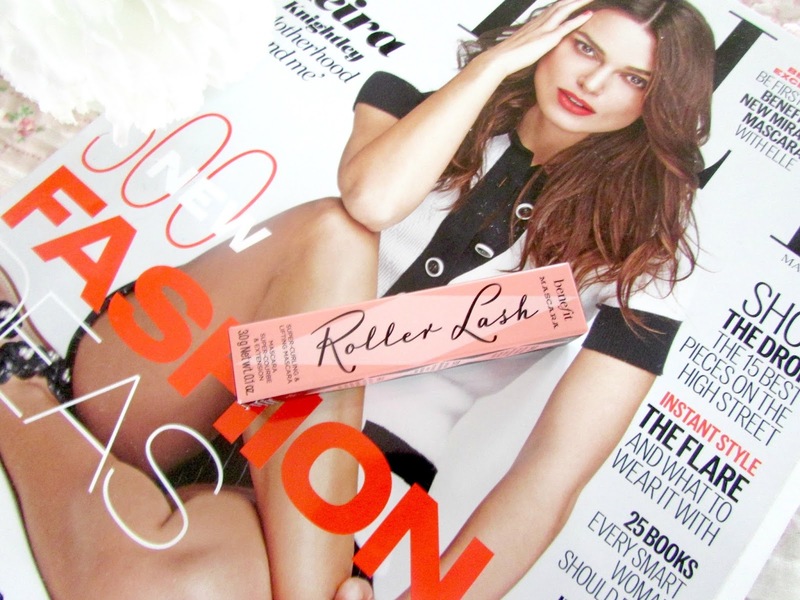 I've already done a review on this mascara which you can find HERE. I just love this mascara. I had been after a decent mascara for months and just wasn't able to find the right one. 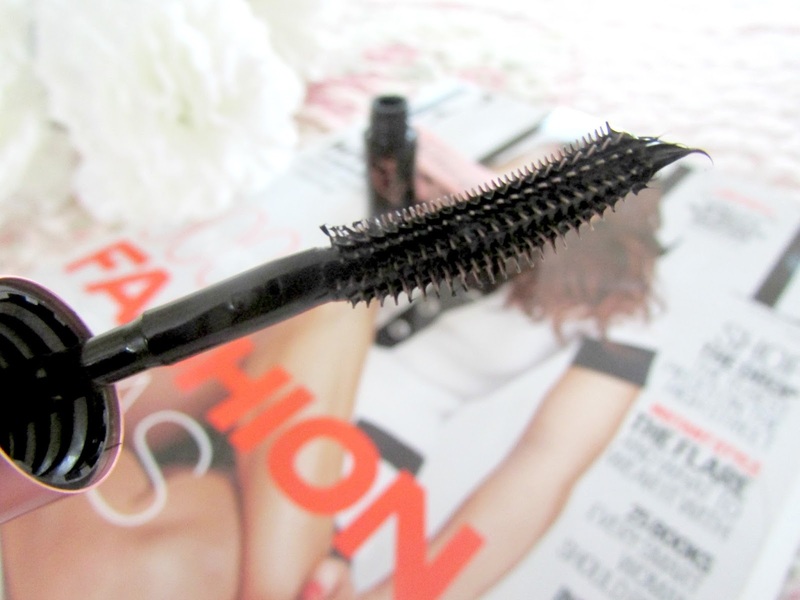 I absolutely love everything from this mascara. 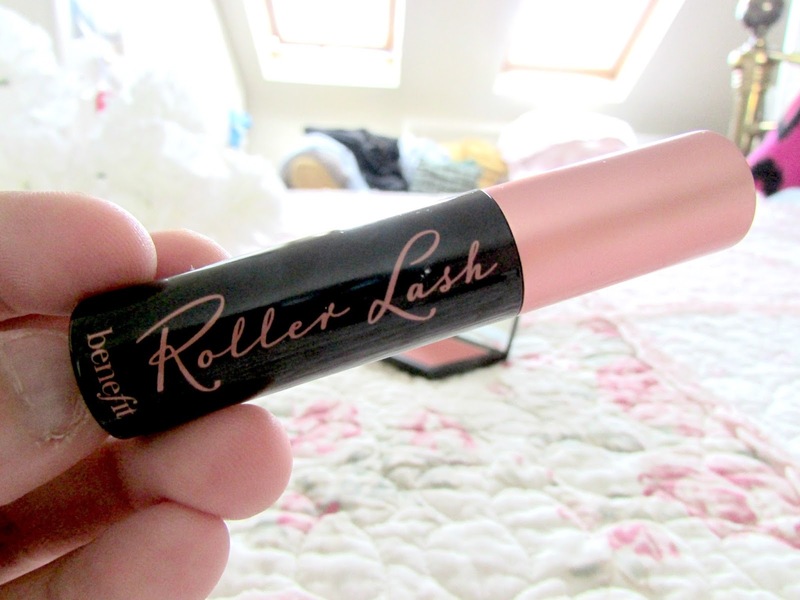 I love how fluttery my eyelashes are when I use this. The curl is just super pretty, it separates the lashes really well and it comes off super easily as well. It launches in stores on Friday so if you haven't had the chance to try it yet I'd highly recommend it. It will cost £19.50. I mentioned this nail polish in my January Beauty Favorites post as well but I absolutely love this nail polish and I haven't been able to stop wearing it. 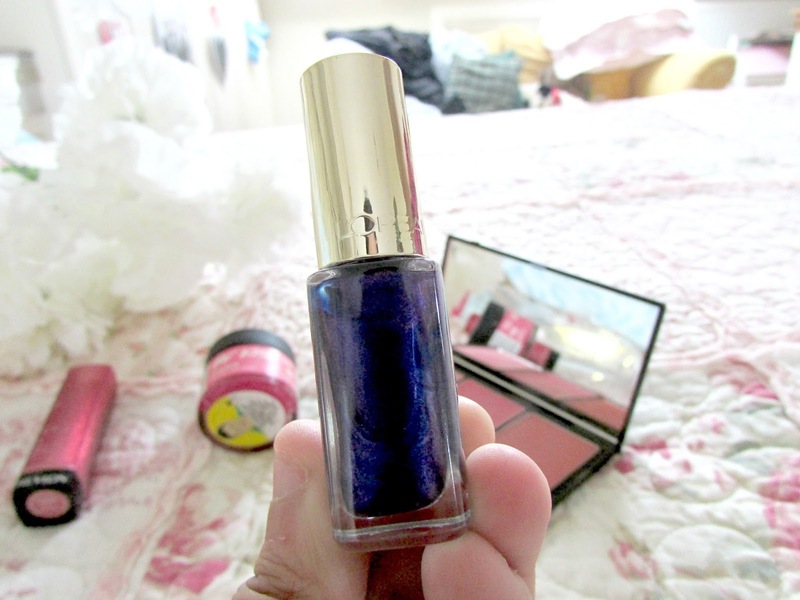 It's in the shade 'Divine Indigo' from L'Oreal and is just a beautiful dark slightly shimmery sparkly purple shade. The nail polish is super easy to apply and doesn't chip for ages. I've picked up a few more shades from this range as well so keep an eye out on a post coming soon! Now that winter is almost over and Spring is fast approaching (well not really as it's still freezing but I'm sure you understand what I mean), I've decided to whip out one of my all time favorite sleek products again. 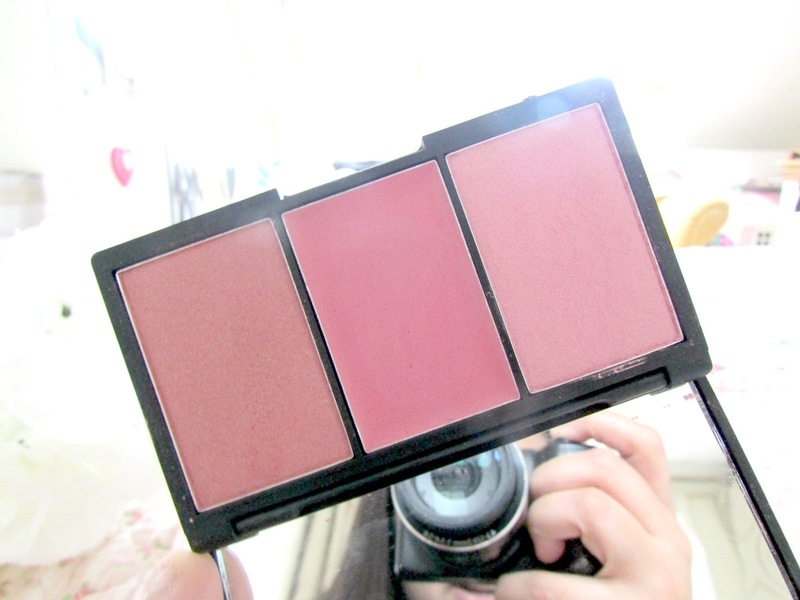 The gorgeous Sleek Pink Lemonade Palette. This palette contains 2 shimmery powder shades and one cream blush too. I absolutely love this palette. All the colors look super pretty and are definitely so easy to apply and blend. I don't know if this is still available but I'd highly recommend it. It's a beautiful palette. When I was taking this photo I was tempted to do a thumbs up in the mirror. It was a long day and I needed to entertain myself okay ;)! 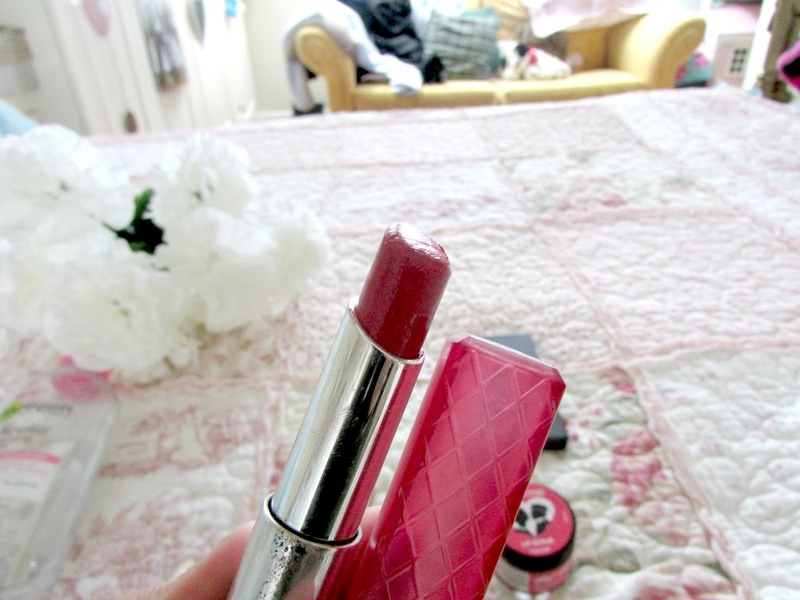 A holy grail product for me is the gorgeous 'Berry Smoothie' lip butter from Revlon. It just suits my skin tone so well. I absolutely love the color payoff, how easy it is to apply and the fact that it is just so incredibly moisturizing too! I haven't bought any colors from this range in ages. There was a time when I was a little bit obsessed! Now this is the only color I use. It's just super pretty. I'd highly recommend it if you're looking for a nice everyday shade to wear. I don't even think this needs an explanation. 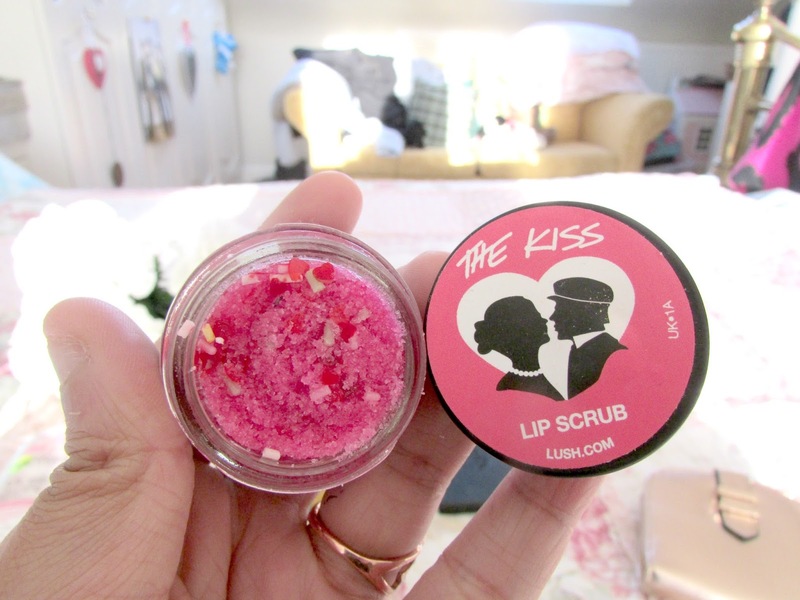 I'm sure those of you who have been reading my blog for a long time know how much I love the Lush Lip Scrubs. When I saw they were doing a limited edition version for Valentines Day I just couldn't resist. This one had a bit of a twist though. As well as the normally sugary mixture they added a few sugar strands and hearts as well which I thought was an extremely love touch. Like with all the other lip scrubs this does the job incredibly well and leaves your lips super soft and gets rid of all that nasty dryness. I tend to use this in the mornings as well as my lips get really dry overnight. So there we have it. These are all the products I have been loving throughout February. This post seems to be a lot shorter than previous favorites posts but hopefully that means it made it easier for you to read. I can't believe that there are only 3 days left (well, less than three days left) of February. This year is already flying by! Hope you are all having a fabulous year so far. What have been your favorite products throughout February? If you've done a post like this please leave a link below! Hey everyone! So for the past two weeks I haven't been a happy girl at all. I won't bore you all with the details and share why but I've just been really unhappy and haven't really been feeling like my life has been going anywhere. Again I won't share the details as I don't want my blog to be a place of negativity. On Friday evening I reached a breaking point and just got really upset. I spent most of the night just crying and speaking to my best friend and just letting things out. I hated it but I will admit I felt a lot better after it. We all need a good cry sometimes, right? Anyway I have been feeling a bit more upbeat and a lot better the past couple of days and evening though I still get upset and have those moments throughout the day I'm putting a smile on, thinking positive thoughts and powering on through the day. 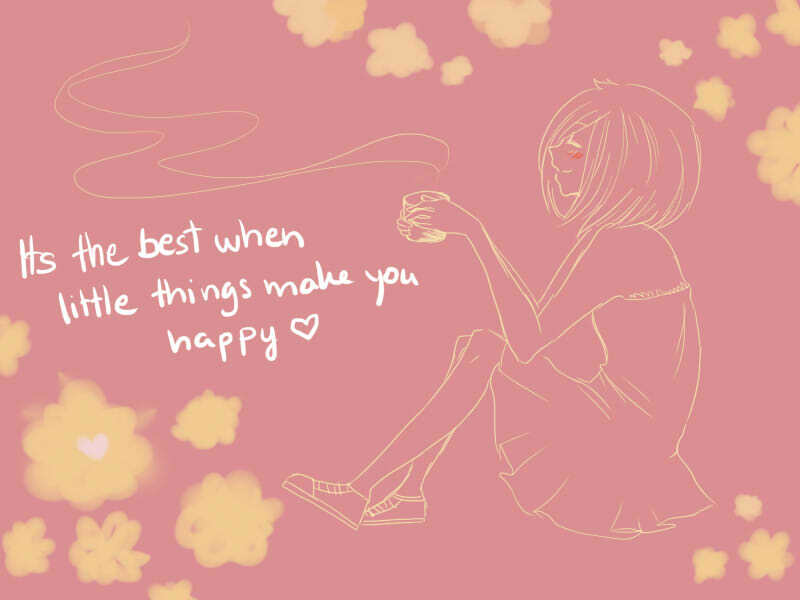 This got me thinking that I should do a list of things that make me happy in life and share them all with you. I already did one of these posts last month over HERE if you'd like to check that out but today I thought I'd do another one. I hope you enjoy it! Shopping & Gossip Girl - Killing two birds with one stone with the above photo!! There's nothing like a bit of shopping to make a girl feel better and happy! 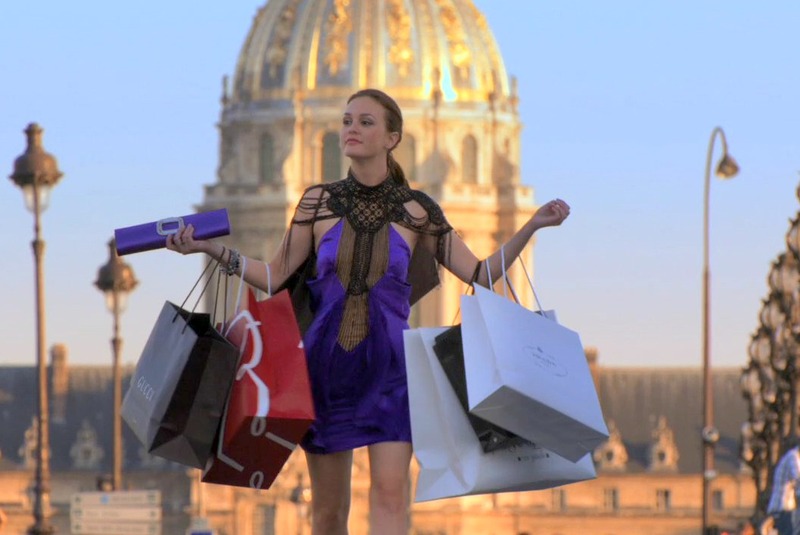 Not even going to lie here, how many of us would feel better if we had Blair Waldorf's budget?! Also Gossip Girl makes me extremely happy. I have started watching it from Season 1 on Netflix again and I'm absolutely loving it! Can someone find me a Nate Archibald please? I know everyone goes on about Chuck Bass but I'm more of a Nate Girl! Girly Films - I just love sitting down with a good girly film and laughing and crying. Clueless happens to be one of my all time favorite films. It just makes me so happy and it's such a feel good film! You can help but smile when you watch it. 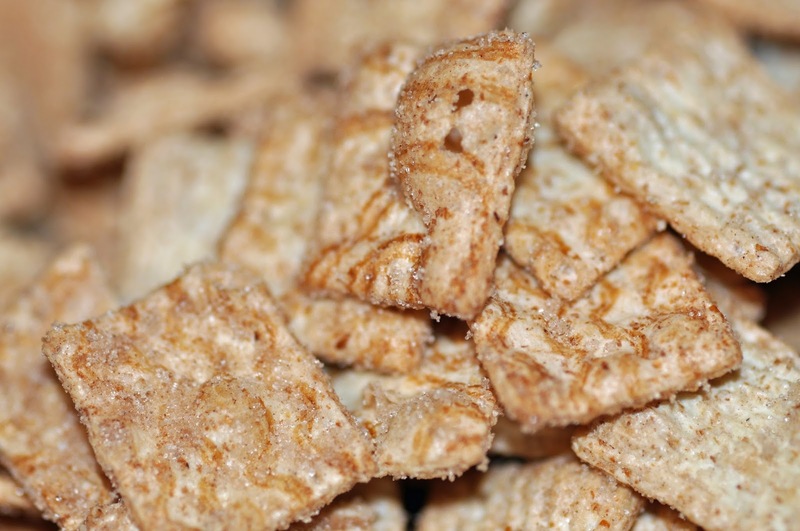 Curiously Cinnamon - I have no idea why it's curious but this is one of my all time favorite breakfast cereals. I find it so delicious and I really don't like eating breakfast. I definitely make an exception for this one though. Fresh Bedding - I absolutely love fresh bedding. There really is nothing better than the smell of freshly washed and clean bed sheets. If you have shaved legs and then get into bed then you have yourselves a winning combination. 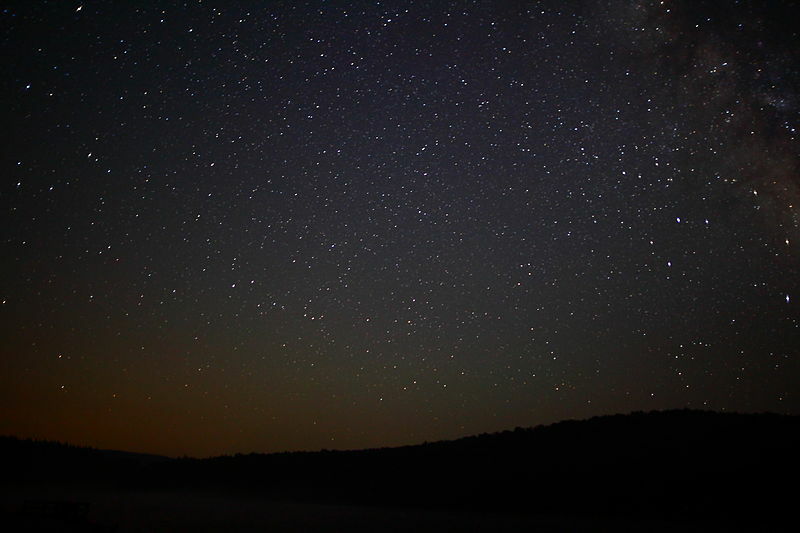 Star Gazing - Now I live in London where it can be quite hard to just lay out in the garden and watch the stars. However it is something I have tried to do on some occasions when the night is very clear. I just think it is so incredibly relaxing. 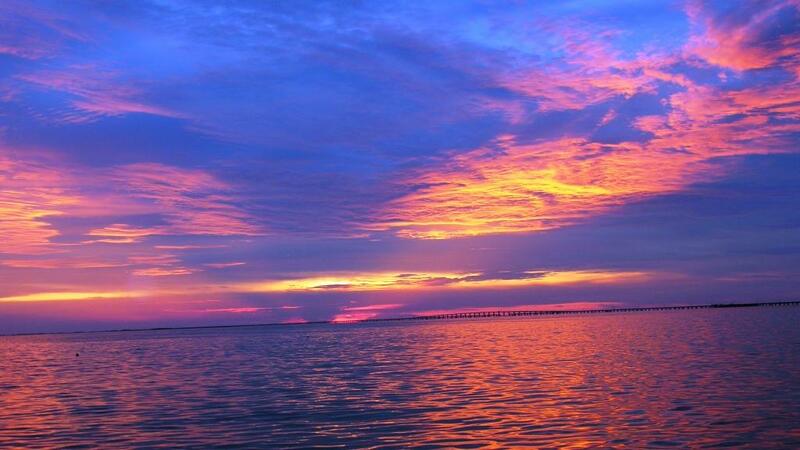 Sunsets - I mentioned this in my last post but I just love watching all the colors light up the sky. Reds, pinks, purples, oranges - it's just so incredibly beautiful. I'm excited for the day when I can go abroad somewhere, head down to the beach and just watch the sun set in the distance. Ice Cream - I'm currently very ill and this is something I'm eating a lot of to make me feel better. 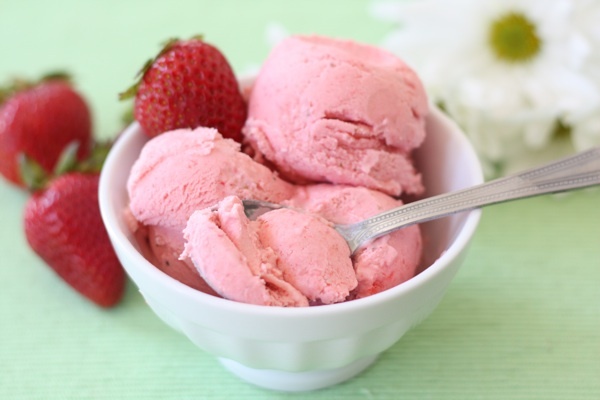 Strawberry ice cream is always a very strong contender. It's just super delicious and refreshing. I tend to eat a lot of ice cream all year round! 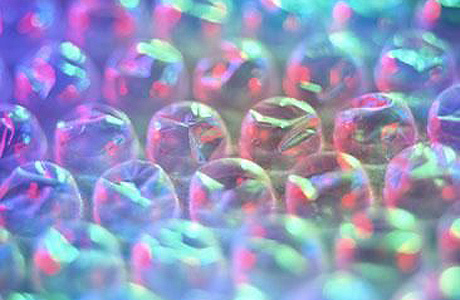 Bubble Wrap - No matter if there's a roll of bubble wrap in the house or if it comes inside a package that I've ordered I will always sit down and pop every bubble. It's just so incredibly therapeutic! My Dad absolutely hates and it really winds him up but I love it! Walks In The Park - This is something I've been doing a lot lately to clear my head and to just think over a few things in my life. It's just so relaxing and the weather the past couple of days has been really nice. I have a massive park just in front of my house that I tend to walk in. 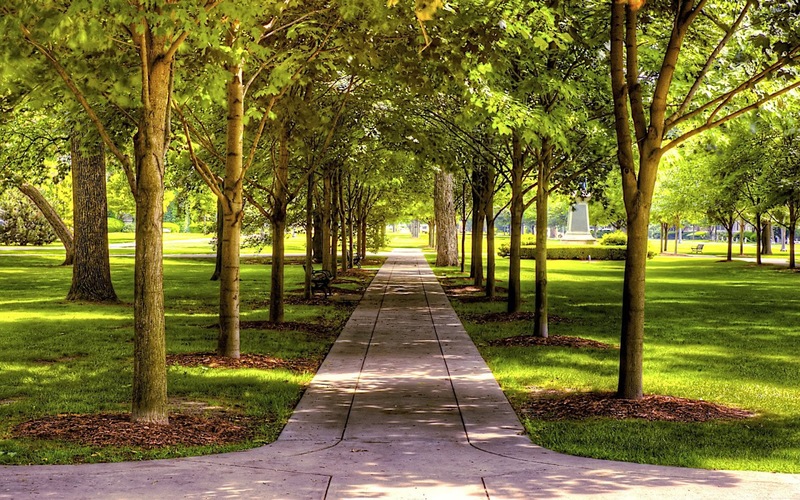 Sometimes if I am in Central London I will walk through Hyde Park too. I love it. My Memory Box - I got this memory box last year for my 23rd birthday and when I came back from Turkey I decided to fill it up with special photos of me and my friends, concert tickets and just special things from my past 23 years of life. It may look like a small box but contains so many amazing memories in it. I love just opening it up and having a look inside. It definitely cheers me up. So there we have it. Just a few more things that make me happy. I might do one of these posts once a month as I think it's a great way of finding out about the person behind the blog. Anyway, I'm going to head off to bed now as it's late but I did really want to get this post up today. 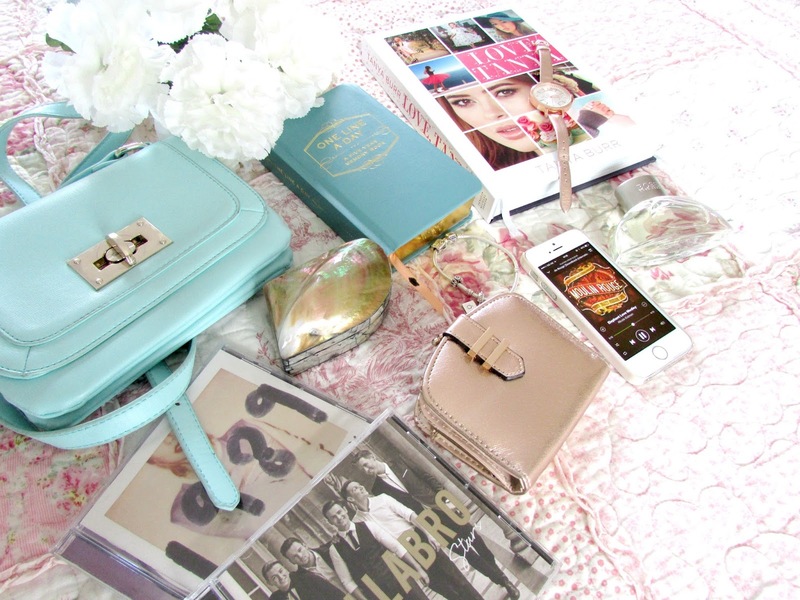 Tomorrow I'm working all day then heading off to my very first bloggers even in London! I'm so nervous but so excited!! What makes you happy? What do you turn too when you are feeling a bit lonely and sad? Hey everyone!! I can't believe it's already Tuesday and the final week of February! This year is already flying by! 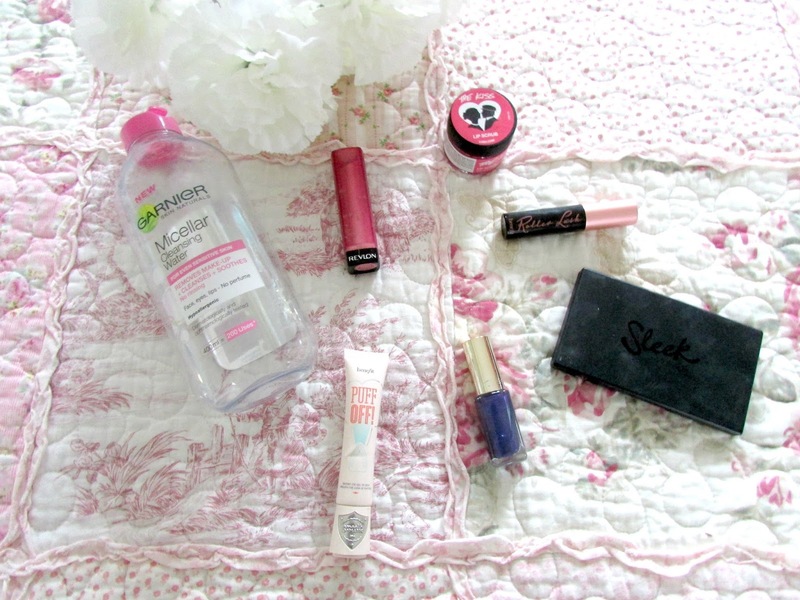 Today I thought I would talk to you about my current non-beauty favorites. I'm going to try and include this post on my blog every single month now as it's something that seems to be viewed quite a lot on my blog. You guys obviously love reading them as much as I love writing them so that makes me extremely happy! Here's what I've been loving throughout the course of this month. First up are two books. 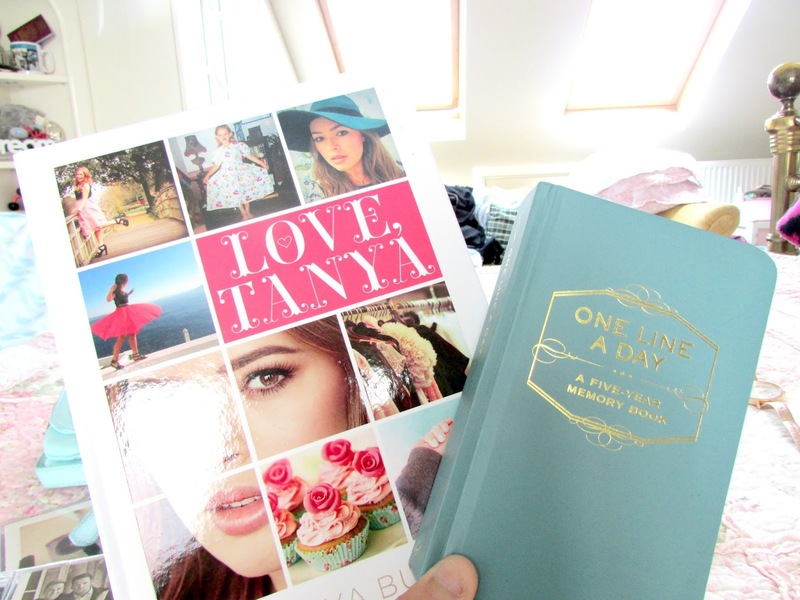 The first being Tanya Burr's 'Love Tanya'. I will be honest and say Tanya Burr isn't a youtuber I used to watch a lot however the past 4-5 months or so I've been so fascinated by her videos. She really does make me laugh and her fashion sense is practically the same as mine and let's be honest she's incredible at make up too! When I saw she had a book out I immediately went to buy it as I knew it would be good and I haven't been disappointed. It's such a lovely book. It's so easy to read and I love the fact you don't have to read it from the beginning. You can open it up anywhere and be on a chapter about her life, or view some of the food and beauty tips she's included in there. It's such a nice book. The second book is my 'One Line A Day - Five Year Memory Book'. I absolutely love this. I've mentioned before in previous posts how important memories are to me and I think having a book like this where I can write down the most special moments of each day, everyday for five years and then looking back on it just makes it so special. If you haven't bought one of these I'd highly recommend it. You can buy them from Urban Outfitters or find them on Amazon. I bought this bag when I was in Turkey last summer as birthday treat to myself and only used it a couple of times. However this month I went on a few nights out and chose this as my bag for the nights. I absolutely love it. It's such a gorgeous color. It's not something that goes with everything so I do have to be careful with what I wear but I still love it. It's such a good size and can fit all of my usual stuff such as phone, hair brush, purse, oyster card, small camera etc. I just love it. The shop I bought it from was called Forever New. 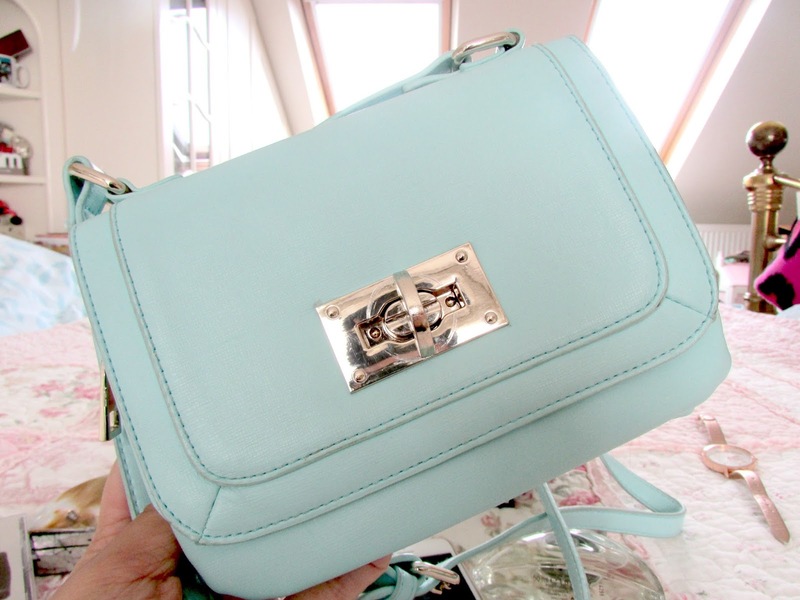 I bought this purse when I was in New Look a few weeks ago purely to use when I take the above blue bag out with me as my other purse is just way to big and bulky to fit in the bag. I absolutely love it. 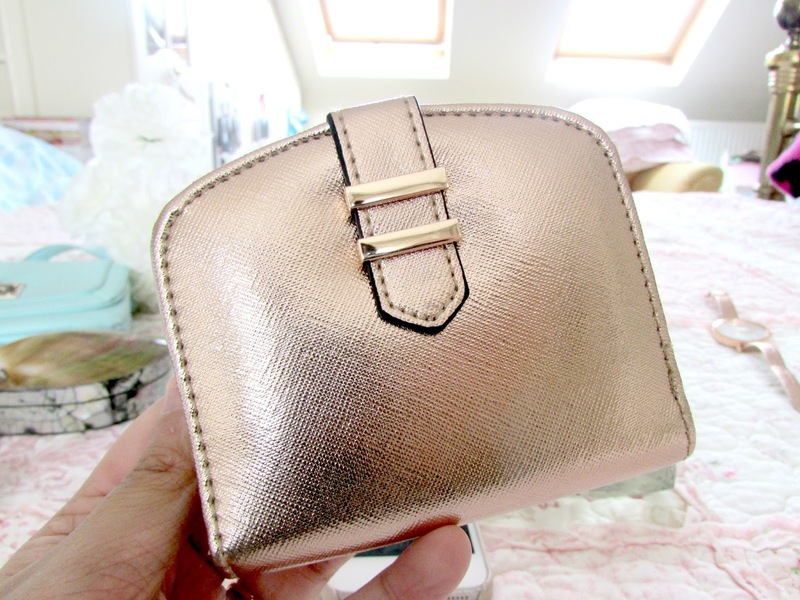 It's rose gold and has all the room I need for my card, money and a form of ID too and just fits onto my bag perfectly. I think this purse is still available and it was only around £4.99 so I'd definitely recommend purchasing it the next time you are in New Look. (Can you tell I'm a little bit in love with that shop?). 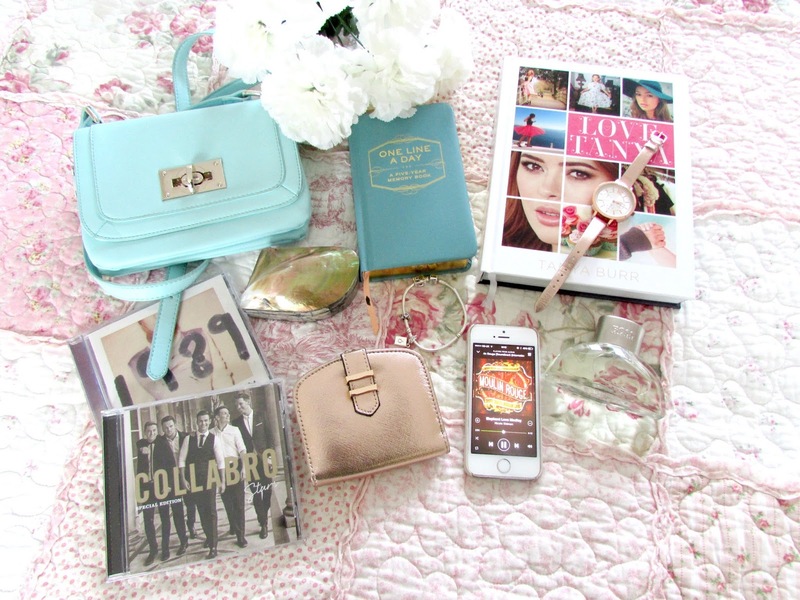 If you read my everyday jewellery post then you will know how much I love the two things pictured above. Both the bracelet and the watch are glued to my wrists. The only times I take them off are to have a shower and even then I feel like I'm missing a limb! They are just such beautiful pieces and so light on the arm. They also go with everything as well! In love! 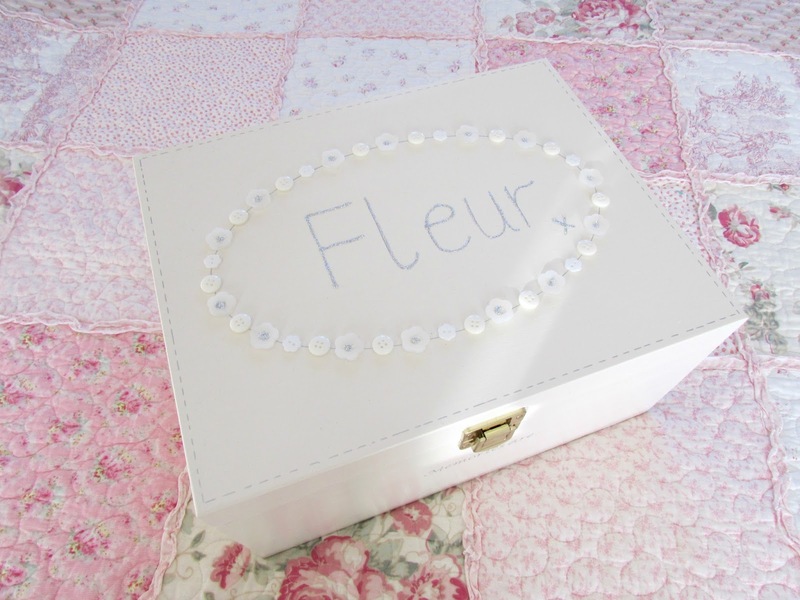 I've been loving this jewellery box at the moment. I think it's so pretty. 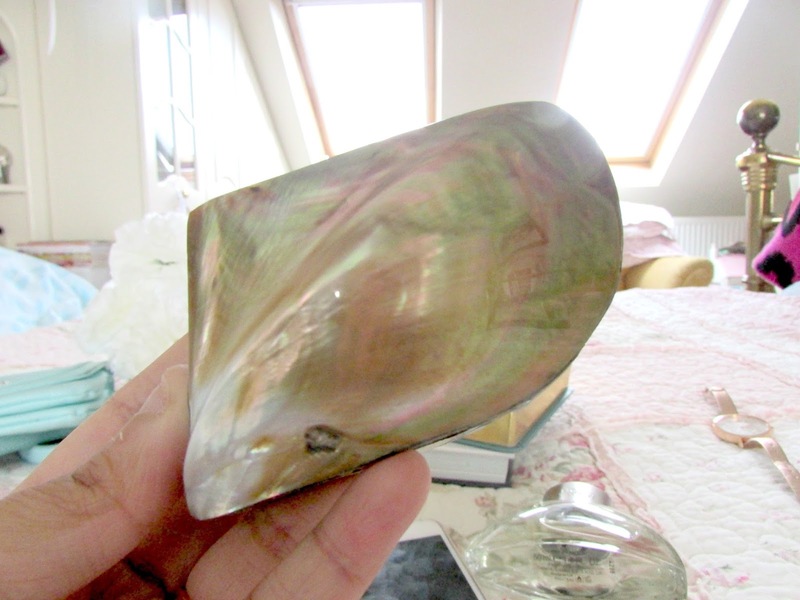 My mum bought this for me from Mauritius last year as a birthday present and I think it's so pretty. I keep most of my favorite earrings and rings in here as it's quite big inside to can fit a lot in. I absolutely love it. 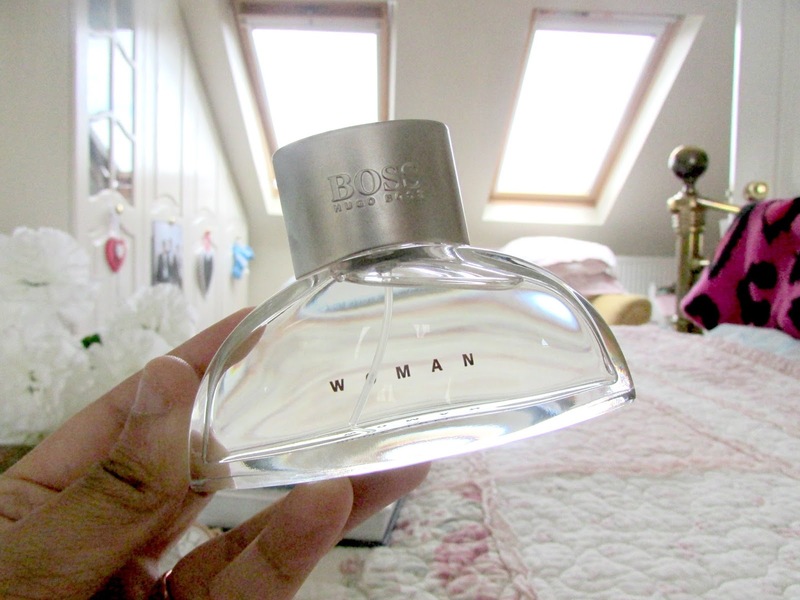 My perfume of choice at the moment is this gorgeous one from Hugo Boss that I got for Christmas! It has such a lovely fruity scent to it which are the kinds of scents I love. It contains notes of violet, freesia, mandarin, mango, white ceder and sandalwood. The scent is honestly incredible and if you are after a new perfume at the moment I'd highly recommend this one. I'm sure if you've been following me on social media that these two albums won't come as a surprise to you, especially Collabro's. I saw them live on the 8th February and it was honestly incredible. I haven't been to many concerts in my life but I can't imagine going to another one that made me feel as emotional as theirs did. If you haven't checked out their album but love musical theatre songs I'd highly recommend it. Don't be put off by the fact they are another boy band. Obviously they are a boy band but definitely not like the ones we're all used too. 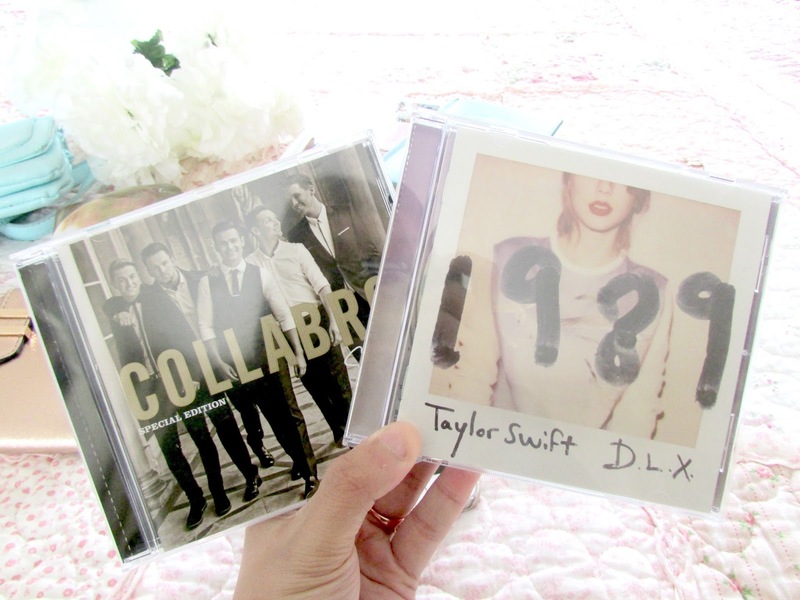 Taylor Swift's '1989' has been on repeat lately as well. I just love it so much. She released her video for the song 'Style' last week and since then I've been hooked on the album again. It's just so amazing and again there are songs on there that I think everyone can relate too. My last favorite of the month has been spotify. I recently upgraded to premium and I absolutely love it. I've discovered so many amazing new songs on there and I'm going to be making a ton of playlists so if you're on spotify type in Fleur Danielle Griffin where you'll be able to find me and follow all my playlists. 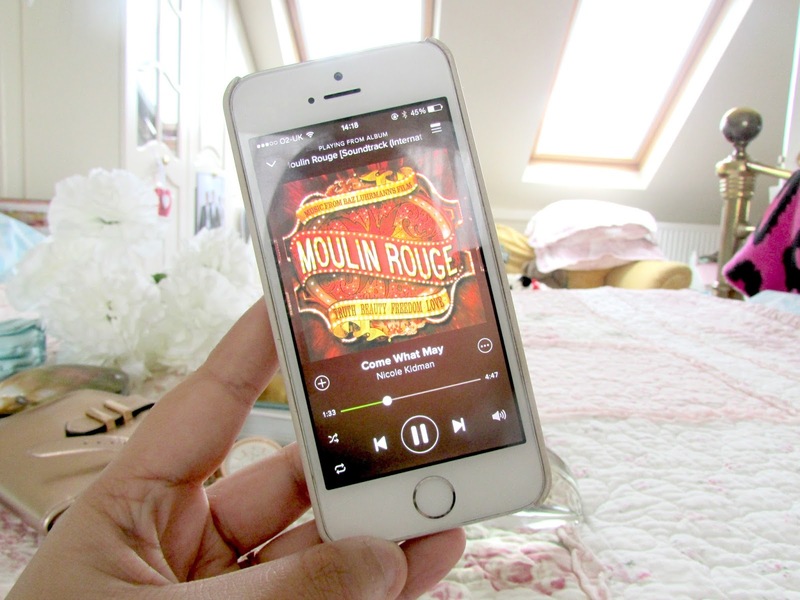 As you can see I'm a bit obsessed with the Moulin Rouge Soundtrack at the moment. I just love Ewan McGregor. Those are all my non-beauty favorites at the moment for this month. Like I said at the beginning I will be doing a post like this every single month just to show you the kinds of things that I have been loving as I think it's very interesting to read a blog and get to know more about the person behind it rather than what their favorite beauty products are all the time. What are your favorite non-beauty items at the moment? Hey Everyone! Hope you are all having a lovely Saturday. 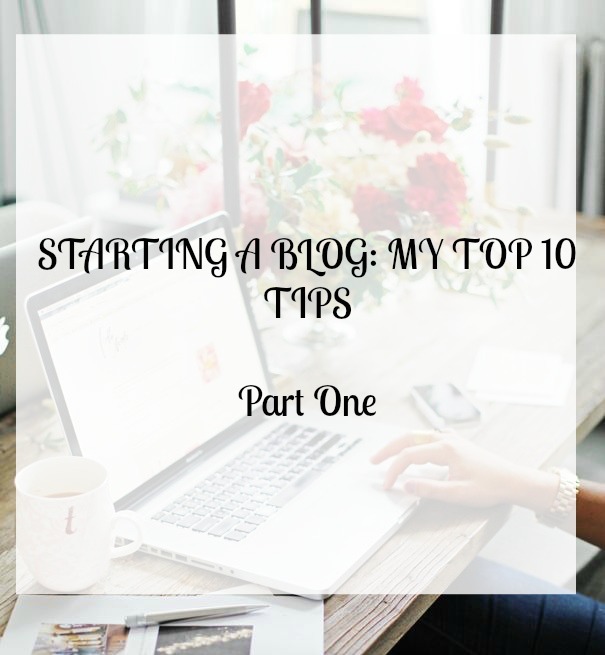 I have come down with a really bad cold so I'm just in bed recovering from that and decided that I would spend the day blogging as I have been really quiet on my blog throughout the course of this month so I do apologize. 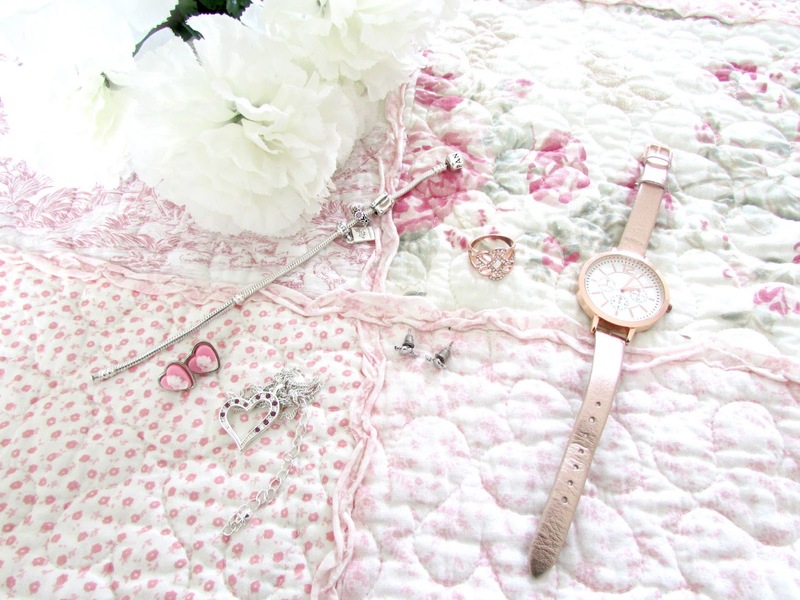 Today I thought that I would talk to you about all my favorite jewelry that I wear on a daily basis. I absolutely love jewelry. My favorite things to wear are bracelets and necklaces and you'll never seen me without earrings in. Here's a selection of what I've been wearing everyday recently. First up is this gorgeous watch that I've had for about 3 weeks now. I have been needing a new watch for ages and I really had my heart set on purchasing a rose gold Michael Kors watch but as I'm not employed full time I decided that it wouldn't be the best idea to spend all the money I do get on a really expensive watch. 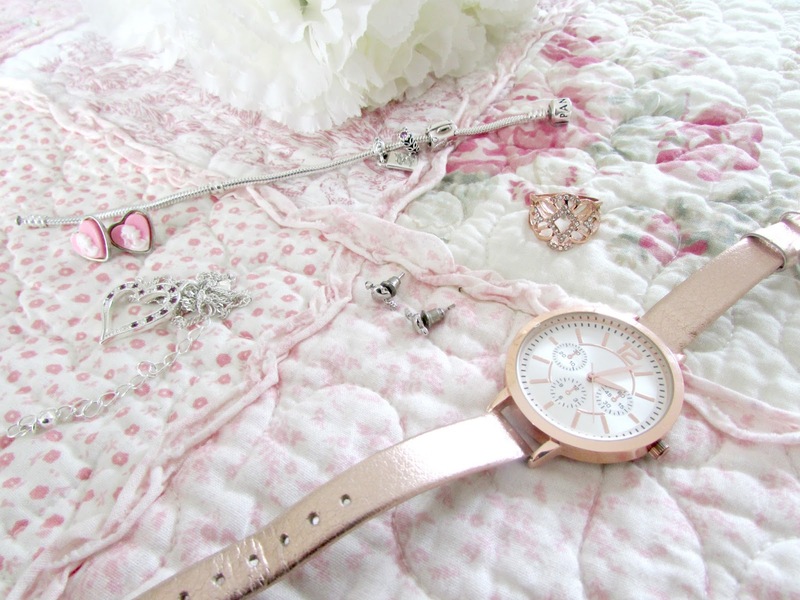 When I was perusing the jewelry in New Look I spotted this watch and I absolutely love it. It's rose gold and I love the leather look strap too. It's extremely light on the arm and I just love wearing it. It also goes with absolutely everything I wear too. This cost me £12.99. I still have my heart set on the Michael Kors watch but until I can afford it this will do me until then. 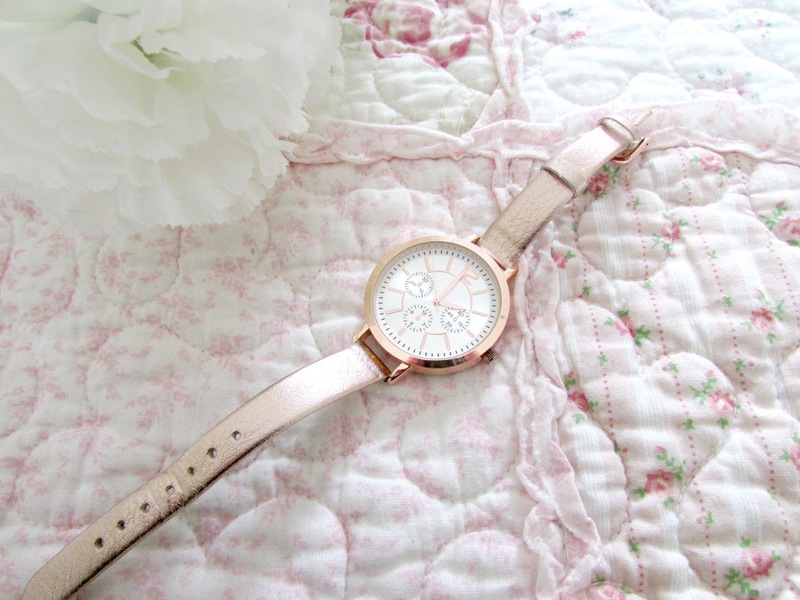 It's a gorgeous watch! 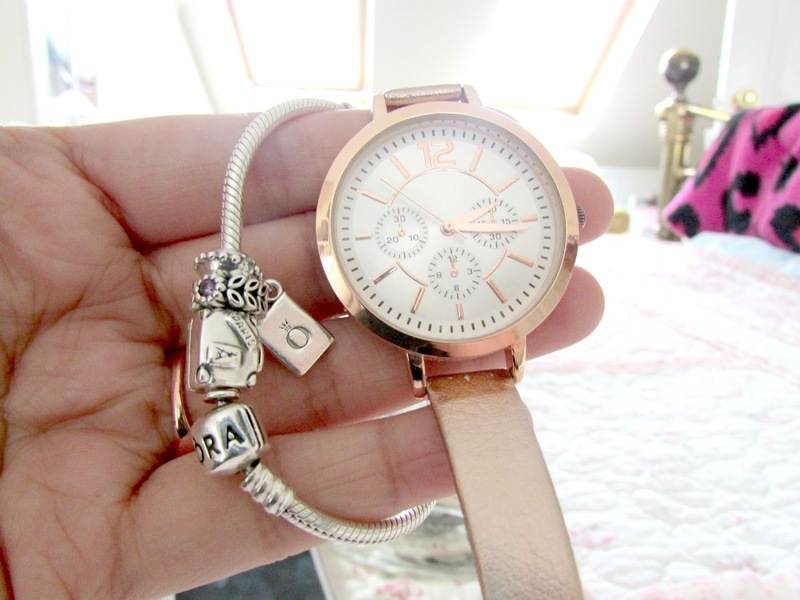 If you have been following my blog for a long time then you will know I have been after a pandora watch for absolutely ages. I was lucky enough to receive one for Christmas and since then it has been glued to my wrist. I only take it off when I have a shower. I absolutely adore it. I think it's so nice to have something that you can wear on an everyday basis that you know will go with whatever you wear. I now have three charms on there. The passport and the suitcase I got for Christmas along with the Bracelet as my Mum and Dad both know how much I love to travel and I decided to treat myself to the other silver charm with the purple gemstone as I wanted to have some color on there! 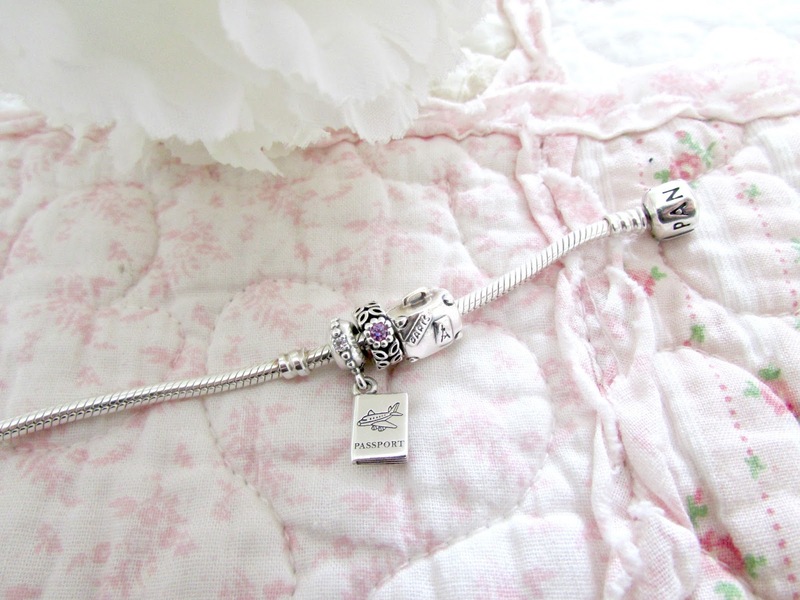 I'm excited to fill this bracelet up with more charms that mean a lot to me. Another piece of jewelry I was lucky enough to receive for Christmas was this stunning necklace. I received this as a secret santa from one of my friends who I worked with when I was in Turkey last year. She keeps saying she's surprised I like it as jewelry is something that can be very difficult to buy if you don't know the person's taste but I absolutely love it. It's exactly the sort of thing I would wear and pick out myself. I love that it's not has purple gemstones in the heart pendent too as it's nice to have some color on there. It goes really well with my bracelet. Again this is something that is glued to my neck. It's just so gorgeous. So far I'm sure you've noticed that I love rose gold and silver jewelry so this ring really is perfect as it contains both of those elements! 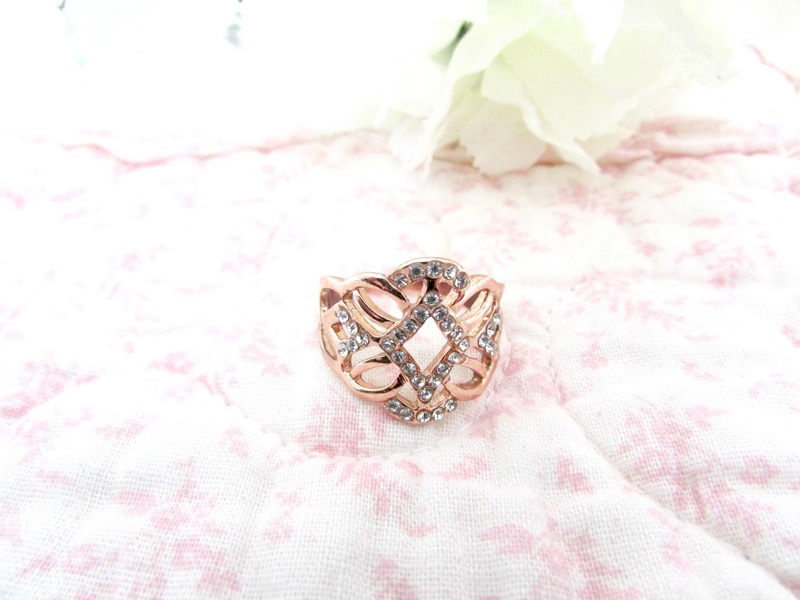 I absolutely love this ring. My brother bought me this when we were Christmas shopping and I absolutely love it. 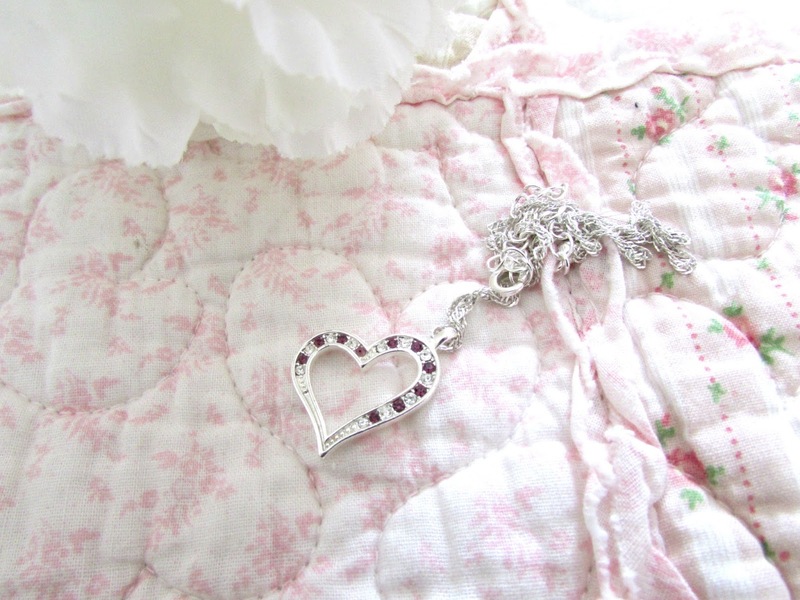 I'm wearing it right now and I love how pretty it is. I'm not really a ring person. I prefer bracelets and earrings however this is just so stunning and when the light shines on it the silver gemstones really do sparkle. It's something I wear on my finger every single day. If you didn't already know I have a bit of an unhealthy obsession with earrings. I currently have over 200 pairs that are all placed in different categories in different jewelry boxes on my dressing table. I just love earrings so much and I don't even know why. However at the moment these are my favorite pairs to wear. 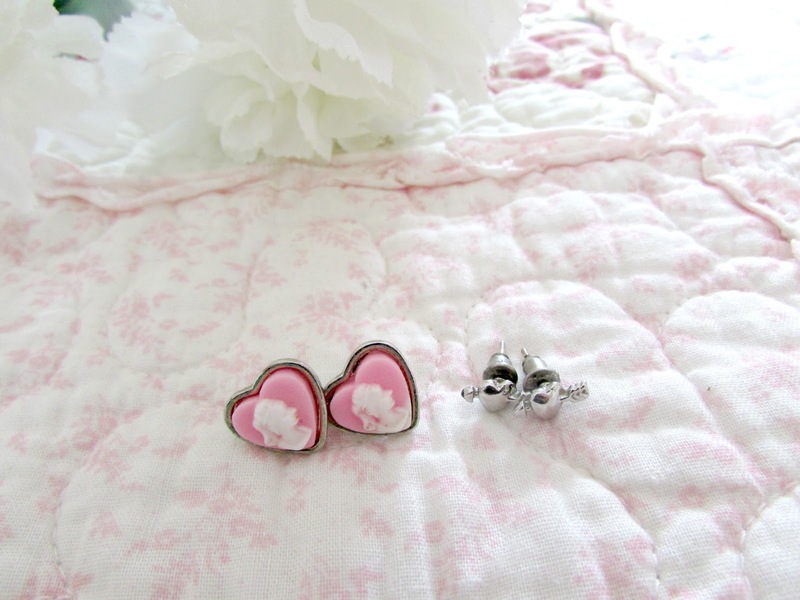 I absolutely love the chunky pink heart because of the design on them. I think that they are really pretty. The silver earrings I have had since I was about 12 years old when my Dad bought me them for Christmas. I think they are so pretty and they just go with absolutely everything. I can have these in my ears for months at a time. I just love them so much and I can't believe I have had them for almost 12 years now. Crazy! So there we have it, my favorite bits of jewelry to wear at the moment. I really enjoyed writing this post and I hope you enjoyed reading this post. A lot of these items I bought a while ago so I'm unable to provide links however you know where to go if you want the Pandora bracelet and next time you're in New Look just have a quick look near the jewelry if you like the look of the one above. It's cheap and cheerful and there are plenty more like it there too in different colors if you're not sure about the rose gold. What jewelry do you wear on an everyday basis?